I've been reading your blog for some time now. I recently finished a Sprite and had her in the water for the first time two weekends ago. I was amazed at her turn of speed, though she requires some tuning. I will have to move the footrest forward (might need a mod). The oar handles were hitting each other, so I've moved the green and plastic stops, they are now nearly off the ends of the collars. Checked distance between rowlocks, comes out at 4ft 7in, according to the instructions should be 4ft 8in. I'll let you know how I get on and send you some better photos when the sun comes out up here. 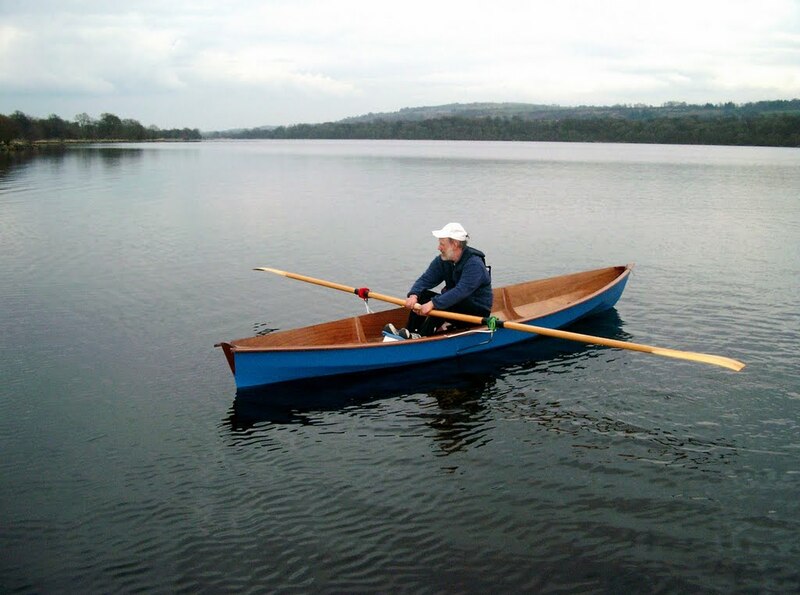 There's a gent from Skye planning a transatlantic row. He was going to depart from New York this June however postponed it for a year due to financial problems. Thanks Stewart - it's great to see another example of one of my favourite boats on the water, and you have done a great job on her! Many scullers, including myself, prefer to cross the handles - the conventional way is to pass the left hand over the right. I have set my blades so my hands cross on the return but the handles just miss each other on the power stroke, so it is easy to pull one oar past the other to change direction. It is a shame Niall Iain has had to postpone his transatlantic row on the toughest route there is, but here's hoping he makes it next year. Is there any difference between a Sprite and a Merry Wherry? The Merry Wherry is a bit of a sore point with the designers of the Sprite, Anders. Basically, the American firm was approached to make the Sprite, and they made some alterations and claimed it was their own design and refused to pay royalties. They have gone bust, I believe. Lets focus on the Sprite then. Can you fold the outriggers when transporting the hull? No, the outriggers are fixed but only by three wing nuts so it isn't difficult to take them off. Just a bit time consuming.